Count on Original HP PageWide cartridges for printing professional-quality color documents. 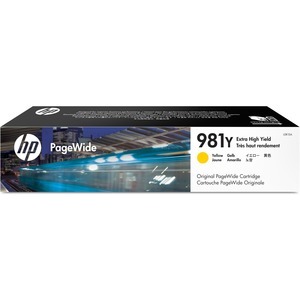 Get consistent quality from this extra high-yield cartridge designed for Hewlett-Packard PageWide Enterprise Color 556dn, Color 556xh, Color Flow MFP 586z, Color MFP 586dn and Color MFP 586f. Original HP PageWide cartridges are precisely engineered to match the high-speed performance of HP PageWide Enterprise printers and MFPs and to deliver fast, consistent results. Easily replace cartridges in a snap and tackle high-volume print jobs without interruptions. HP 981Y cartridge makes printing easy so work flows smoothly. Cartridge yields approximately 16,000 pages.